We just got from a family vacation in Orlando, FL. We spent a couple days at Universal Studios Theme Parks, which was lots of fun. 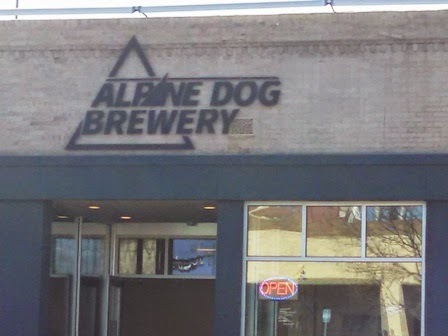 As I was composing the list of Denver breweries that I had not visited, it struck me that most of the letters of the alphabet were covered by the beginning letters of the brewery names. I thought that going through the alphabet would be a fun way to start organizing a plan to visit more of my local Denver Breweries. As the alphabet begins with "A", and there being only one brewery on the list that starts with "A", my first choice is clear. Perhaps you remember my first award-winning homebrew was Sasquatch Hunter German Altbier. I just reminded you a couple weeks ago that this beer won a blue ribbon in the 2013 Denver Regional of the National Homebrew Competition. It came as a complete surprise that this beer won a ribbon. In fact, winning was so far away from my expectations that I didn't even think of saving any to send to the nationals that year. So, I had to brew batch 2 to have something to send to the National Competition. It didn't win a medal, but I was so excited to get to the Nationals that I didn't really care. Not only did Sasquatch Hunter win an award, but I also really liked the beer. It is shocking that I have not brewed the recipe again until two Sundays ago. Not sure exactly why other than I just never got around to it. We went snowshoeing in the Mt. Evans wilderness last weekend. I love snowshoeing. It is so peaceful to be out in the wilderness and there is something about the pure white snow that makes it even more amazing to me. I also really like the opportunity to get exercise. As a bonus, dragging the kids along gets them exercise too.